When the concert dates for this tour were announced, we were certain that the Seattle shows were going to be our first choice. Seeing the band in front of a stadium-size hometown crowd was too good to pass up. We were elated when Heather won the 10 Club Lottery for both shows, including one night in the general admission pit. We celebrated hard the night we bought tickets. In fact, that night was one of the most fun times I have had this year. Now the day had finally arrived. We had driven through Seattle on two previous vacations, but we had never spent any significant time in town, so we were looking forward to checking out The Emerald City, especially since we had a full day off between shows. After having driven most of the last night through Idaho and Oregon, and upon consultation with our phones' GPS apps, we realized that one of the sites we wanted to check out was fairly close to our hotel: this being the gravesite and memorial to perhaps the greatest guitarist who ever lived, Jimi Hendrix. We followed Google Maps to the cemetery in the suburb of Renton, and easily found the large gazebo-style memorial. We were surprisingly the only ones there, and had plenty of time for photos, reflection, and reading all of the lyrics on the walls. Not surprisingly, there were various "gifts" left at the site, including empty alcohol bottles and half-smoked joints. There wasn't a large amount of detritus however. It was obvious they clean the place up daily. We moved on to the luxury accommodations of the Motel 6 in Federal Way, Washington, which is about 20 miles south of Seattle. I was surprised to find our hotel neighbors openly smoking a joint in front of their room when we arrived. It dawned on me that with Washington now being a state where recreational marijuana is legal, that smoking outside of a non-smoking hotel room would actually be the proper course of action, same as going outside to smoke a cigarette. The two ladies were also going to the shows, and offered us some tips on parking in the city. Once we got all of our things moved from the car to the room, we headed into town for the first show. We had GA pit tickets for tonight, but the doors were opening at 4:30, so we knew we were not going to get there in time to be on the rail in front of the stage. We drove up Interstate 5 into the city, and experienced an immense sticker shock at the parking price for the SafeCo Field garage...SEVENTY DOLLARS! Anyone who knows me is aware that I am a notorious cheapskate. You don't make this many trips and see this many shows without pinching a few pennies. No way was I paying that price, even for the relative safety of being in an enclosed garage. So off we went in search of the elusive free parking in a completely unfamiliar town. We got "lucky" and found a spot next to some train tracks about one mile from the stadium. Noting that most of the property around the spot we parked was tagged with graffiti, we locked the car, hoped for the best, and took off walking. The route to the stadium was a direct line up a wide alleyway behind the city's 3rd Street bar district. We immediately experienced a bit of culture shock, as it became apparent that we were traveling through a homeless camp. On both sides of the street were tents, old campers/RV's, and cardboard shanties. 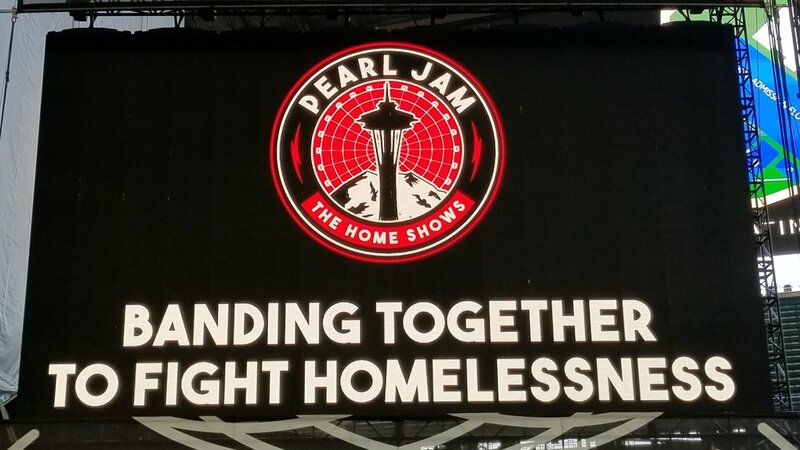 The band had announced that proceeds from the Seattle shows were going to be used to help fight homelessness in the city. They definitely picked the right venue if they wanted the issue to be right in front of your face. We got inside the stadium about an hour after doors, but we were still able to get a spot about ten yards from the stage. A little while after we got there, the roof started to open, causing a huge roar of approval from the gathering hordes. At 8:30 PM the band took the stage with "Long Road," appropriate since so many of us had taken the long road to get there. Over 2,400 miles for us alone. They followed that up with one of their usual openers, "Release." Pearl Jam tends to open their shows with one or two mellow numbers and ease into the rockers. They like to pace themselves. 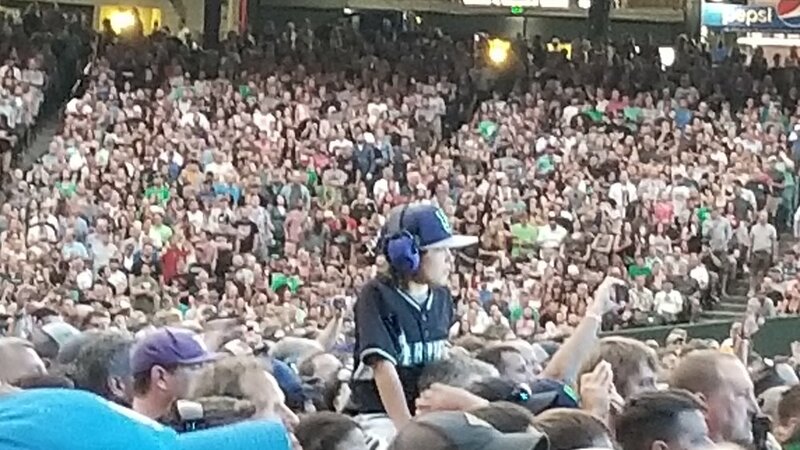 After several numbers, Ed Vedder spoke to the audience and said, "Hello, we are Pearl Jam, and since this is Seattle, we must be...home." He also informed us that they had raised over $11,000,000 for Seattle's homeless. Read that again...ELEVEN MILLION DOLLARS. Say whatever you want about this band, but they put their money where their mouth is, as they say. We all rocked our hearts out together for the better part of two hours before the band left the stage, delivering several hits as well as their usual deep cuts before finishing the main set with "Porch," always a raucous audience pleaser. For the first encore, Vedder asked everyone in the audience who had at least one teacher who changed their life, to raise their hands. He then brought out his two daughters and each of their favorite teachers, and they danced together as he played an acoustic cover of The White Stripes song "I Think We're Going To Be Friends." That is certainly one way to make sure your kids don't flunk out of school! Later, singer/songwriter Brandi Carlisle came out and joined them for a cover of her song "Again Today." She seemed as amazed to be on stage with them as any fan plucked from the audience would be. After another encore (they almost always play two long encores and enough songs to count as a second set, it's one of the things that make their shows worth seeing), they finished the night with their usual closing number "Yellow Ledbetter." As he often does, Mike McCready tagged the end of the song with a few bars of Hendrix's "Little Wing." I reflected on our visit earlier to the great man's final resting place and thought about how this day of Rock greatness had come full circle.